This section of the Southern Upland Way has a more "Highland" feel about it, crossing Galloway Forest Park near its more rugged peaks. 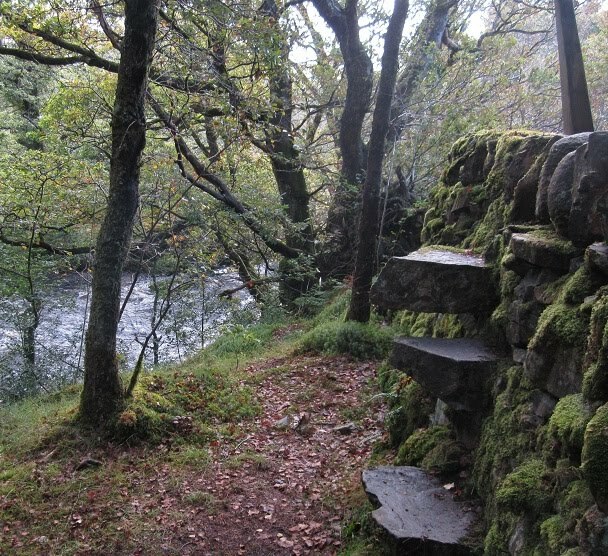 It never ventures onto the higher terrain, keeping to the forested glens with only a couple of gentle passes involved. 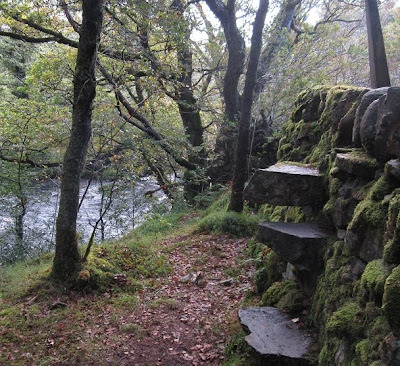 The character is always changing, from leafy riverside and lochside trail at first, to more open and desolate country scarred with expansive forestry, but finishing with a pleasant wooded descent (albeit on tarmac). 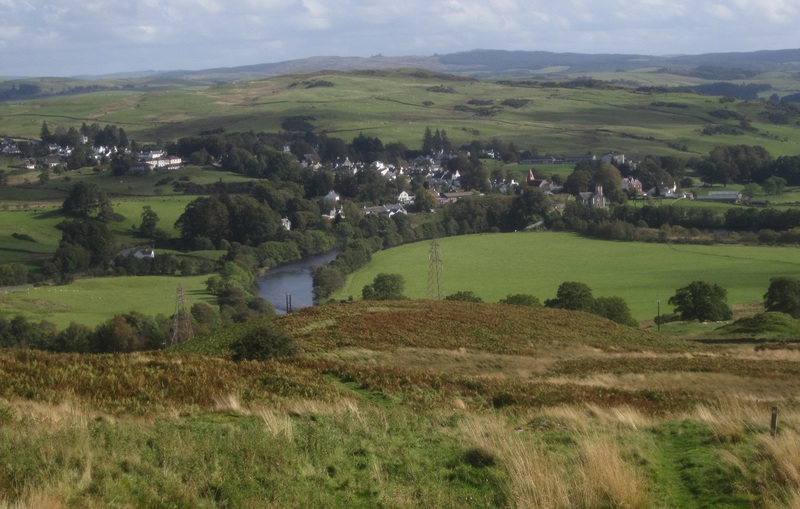 A final modest climb up Waterside Hill is well worth the effort, giving the day's most open view of the surrounding countryside, with Dalry just an easy mile below. Its been too long since we last did this! Back exploring the Southern Upland Way, and the surrounding area. 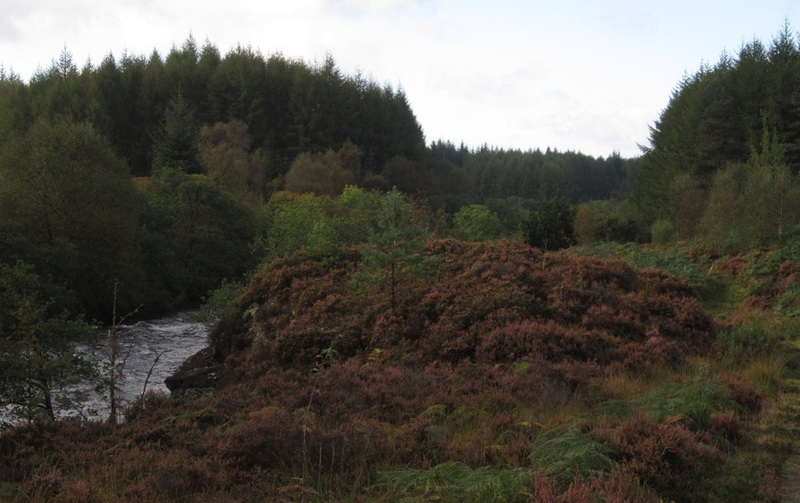 September/October is my favourite time of year in Scotland - weather's still mild, but the midges aren't so bad, the heather's still out, the bracken is golden and the leaves are just starting to put on a show. 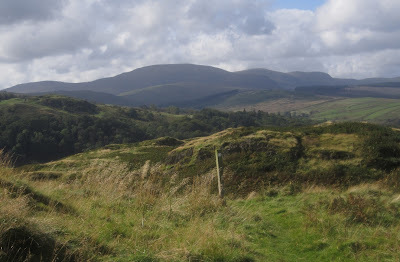 Just South of Bargrennan (I must have blinked when we drove through), there is a layby close to where the Southern Upland Way crosses the A714. The sun was reflecting brightly off the road, wet from a recent downpour. I knew from a phonecall with the Ken Bridge Hotel, where the campground was waterlogged, that today promised to be a very squelchy day. I set off very relaxed onto the river-side trail, soon becoming less relaxed as the wet tree-roots seemed to be trying to send me down into the water! 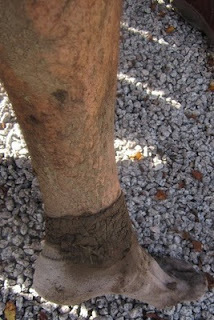 Reckon my socks were already soaked and my legs sprayed with bog within the first mile. I overtook a couple of lassies taking their mountain-bikes for a walk, then the route did become firmer and the trees backed-off giving me a few glimpses of the surroundings. Yes it was boggy in places but all runnable and the river-side setting way very pleasant, I was happy to be back running the Southern Upland Way again. 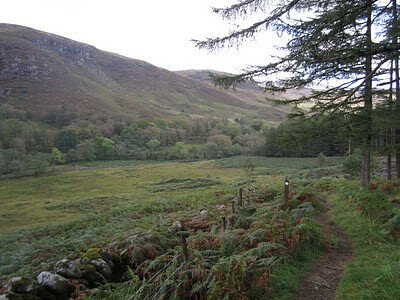 After passing through the abandoned campsite at "Caldons", the character begins to change as the steep-sided and forested slopes of Glen Trool are entered. 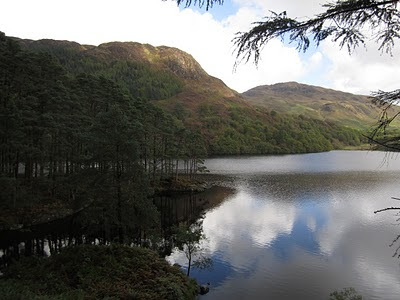 I was still feeling fresh enough to enjoy all the seemingly pointless short-sharp ascents and descents through the trees, and had to stop several times so I could take in the occasional view across Loch Trool. 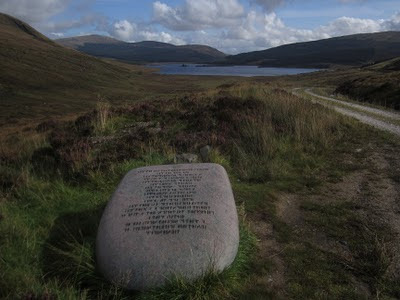 I could see across to Bruce's Stone, and above it the trail through the Bracken which forms the start of the Merrick Hill race. At the time I ran this, they seem to have re-routed the S.U.W. 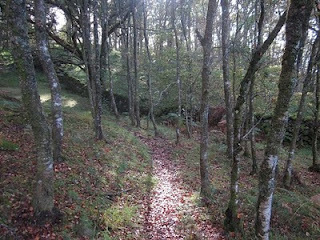 along the forest trail (sharing it with Cycle Route 7) instead of the way marked on my map (which heads ascends the same watershed but by a more open, rougher route). I didn't mind, don't think there was much difference between the views. There was certainly a difference between one side of the watershed and the other, however, as the land opened out and Loch Dee presented itself below. This was one of those sections which I think might be a bit tedious to walk - forestry road is fine in short stretches but mile after mile with squares of logging operation on either-side, not so great! It did give me the chance to stretch-out the stride a bit, and so it wasn't so long before I was above Clatteringshaw's Loch, and looking out for my dad somewhere on the trail ahead. We met up where the route becomes a trail again, and I admitted to him he wasn't missing out on too much if he turned around to go back from where he was! 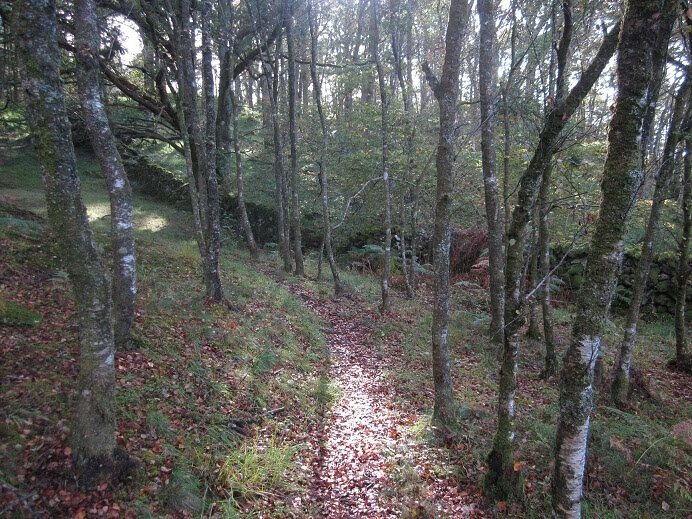 I followed his footprints back up the squelchy/stoney path up a firebreak and out onto open moorland. Only 5 miles to go from here, and mostly downhill. Which was a good job because my legs were beginning to stiffen up and I was ready for a pint or two. The descent went from trail to track to tarmac, my car sitting where my dad had left it so I could pick up a change of dry clothes and be slightly more presentable at the pub. The road down was pleasant enough - helped by lack of cars - but it was nice when a fingerpost sent me off it down to the riverbank instead. Over a bridge and into a field with a swamp and a bull in it, I sank nearly up to my knee in a marsh as I tried to keep as close to the fence and as far from the bull as possible. 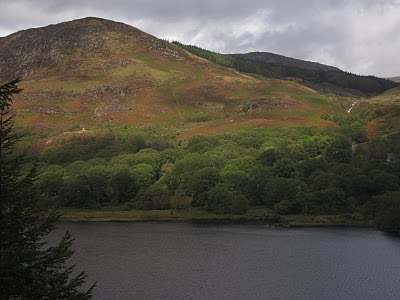 Was glad to get to a style and onto bracken-covered hillside, and start ascending the final wee hill of the day, which was easier going than I'd prepared myself for. And nicer too - the view from the top, both looking back over the Galloway Forest Park from where I'd come, and forward over Dalry, the destination, with distant lake-district peaks visible. Got to the Clachan Inn, two minutes later my dad was there too, and we were sitting in the sunshine with beer and a post-exercise buzz. We were both glad to be back to the "Southern Upland Way" project, and already making plans for the ultimate stage - Bargrennan to Port Patrick, where we have decided it would be nice to jog the last 5 miles together to complete what we started in the frosty early months of this year. We're both going to have to get a bit more training in! NOTE: This is what this section of the Southern Upland Way does to your legs. The next day (Sunday) we did a nice short walk in "Ness Glen" a few miles to the North by Loch Doon - a gem of a gorge walk.